Should You Order the Mamatiffin? How good is Mamagoto’s new lunch delivery service? 1. We have all known the pain of waiting for delivery of food to arrive, especially on those slow work days. The MamaTiffin arrives exactly on the dot, as promised when you place the order. 2. You can choose between five varieties of the main course, with plenty of vegetarian options available as well. While we expected the delicious flavours, we were pleasantly surprised by Mamagoto’s typical aroma emanating from the food, which was as fresh as it would have been served at the restaurant. We also couldn’t get enough of the accompaniments – a tangy som tam salad and perfect pan-fried gyozas. 3. If working in South Mumbai didn’t have enough perks already, now people can enjoy hot food from Mamagoto, without having to step out of their office. These yummy tiffins are fuss-free, come with cutlery and are perfect for those long lunch meetings. 4. 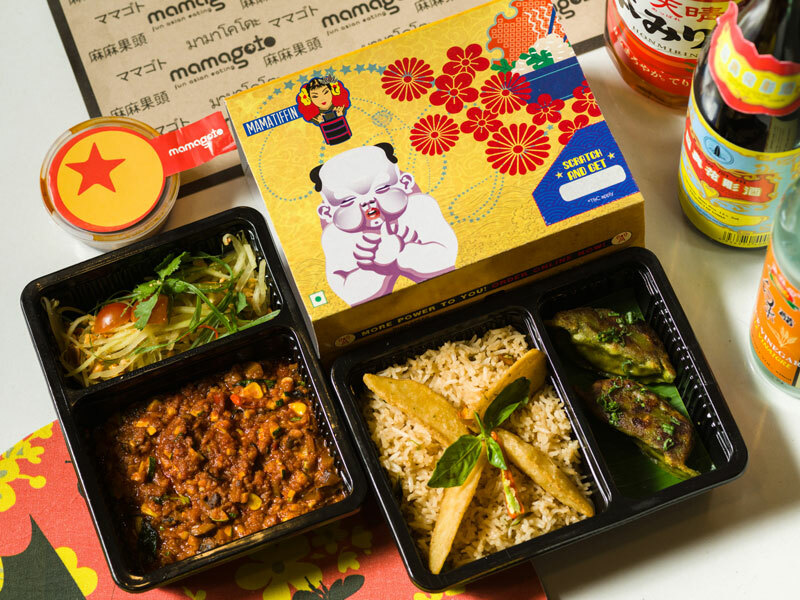 The tiffins come in colourful boxes covered with their signature Asian graffitti-style doodles. These lovely boxes are perfect to liven up drab office days. 5. The portions are great – usually a meal for two. Or if you want to indulge on those days of gluttony, dig in alone.